In Gaetano Donizetti's opera L'assedio di Calais. It all started with Pierre-Laurent Buirette de Belloy (1727-1775), esteemed member of the Académie Française, and his play Le Siège de Calais. It was written after the Seven Years' War and benefitted from a strong patriotic current, though some critics, like Voltaire, pointed out using a defeat was not the best way to glorify France. Though it was realistic in the historical context since the Seven Year's War bereft France of much of its former glory - and its colonies in America. Half a century later a certain Hubert wrote Eustache de Saint-Pierre, which was based upon Belloy's play, but with stronger revolutionary undertones. Eustache is the major of the unfortunate Calais. The play then came to Italy via an adaptation of a Hubert's play, on which Salvatore Cammarano based his libretto. There was also a ballet about the subject that was pretty popular at the time. The opera had its first performance in Naples in 1836. Historical context is the siege of Calais in 1346 which started the Hundred Years' War. What has me curious here is the fact that in the opera the name of Edward III's wife is Isabella, not Philippa. I admit I didn't bother to get my hands on the various plays so I don't have an idea at which stage our dear She Wolf crept in and replaced her daughter-in-law, but I thought it was a fun little detail. Before I launch into a retelling of the intriguing and probably very unhistorical plot of the opera, I'd like to ask the Edwardians on my blog if they have any information about the real siege of Calais. Yes, I'm lazy. 1347 - the siege of Calais has lasted for some months already and the inhabitants of the town starve. The first act starts with a chorus of the English chasing Aurelio (Aurèle? if he's historical), son of the major, who had sneaked into the camp of the besiegers in order to find some food for his starving wife and child. 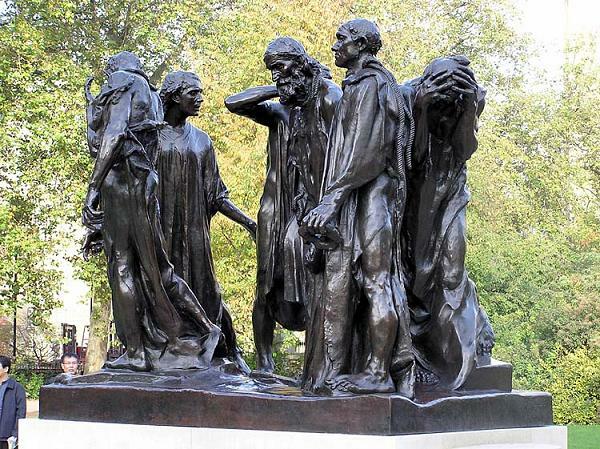 Eustachio (Eustache, he is historical) the major of Calais, and Aurelio's wife think he has perished in the attempt. Giovanni d'Aire (Jehan d'Aire) enters and tells them Aurelio escaped. Aurelio asks his father what hope is left to them. None but surrender, Eustachio replies. There's a rumour outside, citizens blaming Eustachio for the mess. He goes out to meet them; some men try to kill him. Aurelio and others stop them but Eustachio bares his chest and demands the assassins stab him. Moved by so much courage, they step back. It turns out a stranger had pushed the citzens, the man is now unveiled as English spy. Second act, night: Aurelio's wife Eleanora (a standard opera name) prays to God to save Calais. Aurelio awakes from a nightmare and sings about the death and blood he has seen. Next day, meeting in the town hall. A messenger from King Edward has arrived: the king will accept the surrender of Calais, but six borghers of noble birth shall be executed as example for the other rebellious cities in France. Aurelio tells the messenger the citizens of Calais would rather die in battle than suffer such an ignominity, but Eustachio silences him. 'The king's conditions will be accepted,' he tells the messenger. Eustachio then explains to the crowd that the prize of six lives will not be too much to save the city and the women and children, and enters his name on top of the list. Aurelio wants to join him, Eustachio tries to keep him back, others enter their names under the admiring murmur of the crowd, among them Giovanni d'Aire. Aurelio tears himself out of his father's embrace and signs the list, 'morremo insieme' (we'll die together). Eustachio asks the hostages to kneel and pray. The crowd joins in the prayer. O sacra polve, o suol natìo. È giunta l'ora... per sempre addio. In sua pietade il re dei re. The third act: King Edward III is happy. Finally, the three crowns of England, Scotland and France will be his. "The future will all be a triumph, a victory for me. France, Scotland and Albion will be reined by one bridle. The splendour of three crowns will will gleam on my head." (my translation). I can't help wondering where he'll put three crowns? One on the head and two dangling from the ears? Fanfares and choirs announce the arrival of the queen who obviously single-handedly has conquered Scotland (e sia la vinta Scozia), something the misplaced Isabella surely didn't achieve, and I doubt Philippa did. There's a glint of the true Isabella when she says, 'I thought we'd meet inside Calais.' - 'Soon,' Edward replies. The hostages arrive, accompanied by relatives. Eustachio delivers the keys of Calais and cofirms the victims are ready to pay for the love of their country on the scaffold. In vain, the relatives plead with the king. Eustachio tells them not to beg. Aurelio sings a farewell to his wife and infant son. At that point, most of the people are in tears already. Finally, the hostages tear themselves off. 'Al supplizio ne traete' (take us to the torture). The English are moved by so much courage, and the queen herself pleads with her husband to spare the unfortunate victims. Edward accedes and is hailed for his clemency. Note: The role of Aurelio is sung by a so called musico, a female singer in a male role. It was a habit after the castrates came out of fashion, albeit the use of musici began to decline in Donizetti's time. Since composers wrote for certain opera houses and had to deal with what singers were avaliable for the time, they often had to make concessions to the voice ranges. Donizetti intended to rewrite the role of Aurelio for tenor, but never got to it. In a way, it's a pity because the sextett would have much more impact with male voices only. Another backdated post of assorted pictures, showing cloisters of Mediaeval churches and abbeys in Germany.